The Endo Blog: Wow - Nice Healing! 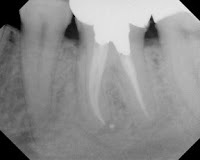 In a previous post I mentioned how a J-shaped lesion is often indicative of vertical root fracture? 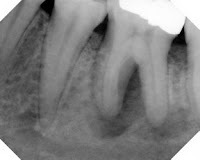 I also mentioned that thorough endodontic diagnostics must always be completed before condemning a tooth with a vertical root fracture. 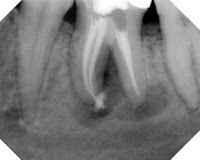 Here is a perfect example of a huge j-shaped lesion, that is not a vertical root fracture. This patient came in today, and I took a 4.5 yr recall on this tooth. Healing is complete. Very nice. I bet the patient is thrilled!